Christopher Kimball’s new cookbook is being released Tuesday. I grew up thinking that time and technique were essential ingredients for developing flavor. After all, that is what French cooking is all about. 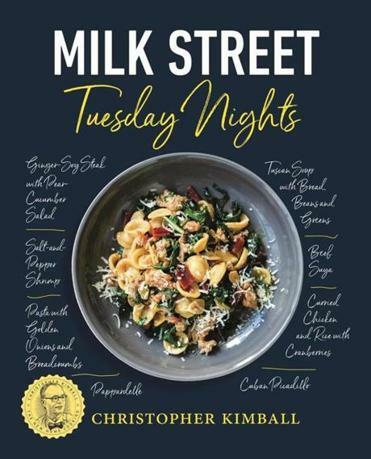 The notion behind Milk Street: Tuesday Nights, however, is to start with big-flavor ingredients and combine them to maximum effect: sweet and sour, crunchy and creamy, tart and mild. 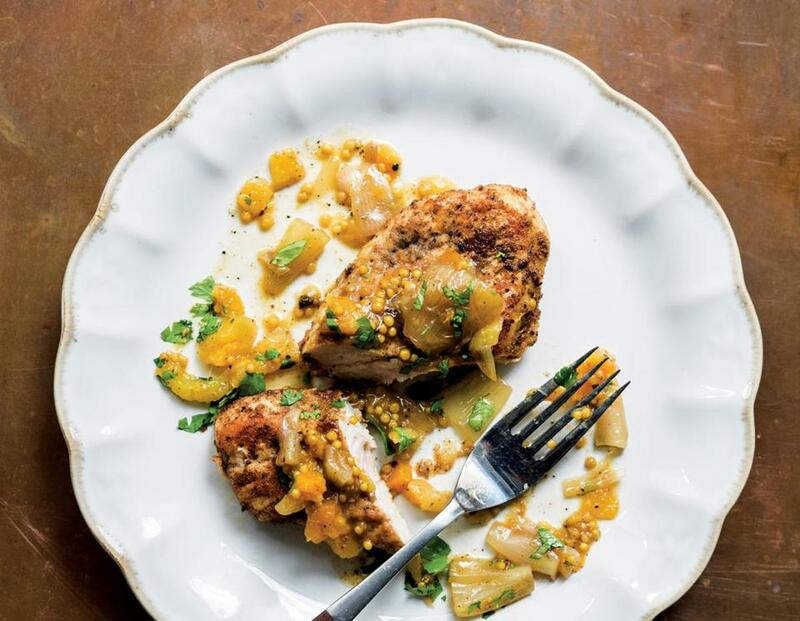 Spiced Turkey Cutlets are coated with cinnamon, cloves, and cayenne and served with an apricot and mustard seed chutney. Kale and White Bean Soup uses anchovies to create a umami foundation in just 30 minutes. Spicy Garlic Soba is flavor-packed with sugar, gochujang, and ginger. As Einstein pointed out, time is indeed relative. Quick-cooking turkey cutlets are the perfect foil for a fruity and savory chutney inspired by Morocco’s tradition of pairing sweet spiced relishes with meats. Pound the cutlets to a ¼-inch thickness so they cook evenly, then dredge them in whole wheat flour, which takes on a nutty flavor during cooking. The chutney, with its balance of apricots, shallots, and warm spices, adds punchy, sweet-tart flavor. If you prefer, substitute dried sour cherries for the apricots. In a medium bowl, stir together the cinnamon, cloves, cayenne, 2 teaspoons salt, and 1½ teaspoons black pepper. Set aside 2 teaspoons of the mix. Whisk 2 tablespoons of the lemon juice and 1 tablespoon of the oil into the remaining spice mix. Add the turkey cutlets and coat on both sides. Set aside. In a 10-inch skillet over medium heat, heat 1 tablespoon of the oil until shimmering. Add the shallots and cook, stirring, until lightly golden, about 4 minutes. Stir in 1 teaspoon of the reserved spice mix and cook until fragrant, about 20 seconds. Stir in 2/3 cup water, the apricots, honey, and mustard seeds. Cover and cook over medium-low, stirring once or twice, until the shallots have softened and the liquid is syrupy, about 15 minutes. Remove from the heat and set aside. Pat the cutlets dry with paper towels. In a wide, shallow dish, stir together the flour and remaining 1 teaspoon spice mix, then distribute in an even layer. Line a large plate with paper towels. In a 12-inch skillet over medium-high, heat the remaining 1/3 cup oil until shimmering. Transfer each cutlet to the flour mixture and turn to coat both sides, then gently shake off the excess and place in the skillet. Cook until golden brown on the bottom, about 2 minutes. Flip and cook until the second sides are golden, about another 2 minutes. Transfer to the prepared plate to drain, then place on a serving plate. Stir the remaining 1 tablespoon lemon juice and the zest into the chutney, then taste and season with salt and pepper. Transfer to a serving bowl and sprinkle with the cilantro. Serve with the cutlets. Spicy, garlicky soba noodles and dark green kale yield a hearty and quick vegetarian meal. Leeks add a delicate onion flavor. We liked using a buckwheat and wheat blended soba noodle, but any variety will work. The dish is fine as is, though a sunny-side-up egg would be a nice complement. Gochujang, a chili paste common in Korean cooking, adds savory-salty heat to the noodles. It can be found in Asian markets and most larger supermarkets. Don’t forget to rinse the soba noodles with cold water right after they finish cooking — they’ll turn gummy and lose their texture if they sit in warm water. And don’t use regular soy sauce; it will make the dish too salty. In a large pot, bring 4 quarts of water to a boil. Add the soba and cook until al dente, about 5 minutes. Reserve ½ cup of the cooking water, then drain and rinse the noodles under cold water. Drain well, then set aside. In a small bowl, whisk the reserved soba cooking water, the brown sugar, and the soy sauce until the sugar dissolves. Set aside. Return the pot to medium-high and melt the butter. Once foaming has subsided, add the leeks and cook until lightly browned, stirring occasionally, about 2 to 3 minutes. Reserve 3 tablespoons of the leeks for garnish. Add the garlic, gochujang, and ginger. Cook, stirring constantly, until fragrant, about 30 seconds. Stir in the kale and reserved soy sauce mixture. Cover and cook on medium until the greens are wilted and tender, about 5 to 7 minutes. Add the noodles, using tongs to gently loosen them as they go into the pot. Stir to combine and continue to cook until most of the liquid has been absorbed, about 2 minutes. Taste and season with salt and pepper. Transfer to serving bowls and top with the reserved leeks. Canned cannellini beans transform this otherwise long-simmering soup into an easy weeknight meal. The Parmesan rind adds a deep savoriness; some grocery stores sell just the rinds, or if you have a chunk of Parmesan in your refrigerator, trim off its rind for use in the soup. If you reheat leftovers, you may need to add some broth, because the soup becomes thicker as it stands. Crusty bread is the perfect accompaniment. Don’t fear the anchovies, even if you are not an anchovy fan. They help build rich, meaty flavor but don’t leave any trace of fishiness. And don’t simmer the soup for longer than directed; overcooking causes the beans to break down and makes it overly thick. In a large Dutch oven over medium heat, heat ¼ cup oil until shimmering. Add the onion and cook, stirring occasionally, until softened, 5 to 7 minutes. Stir in the garlic, anchovies, and pepper flakes, then cook, stirring, until fragrant, about 30 seconds. Add the broth, rosemary, Parmesan rind, and 1 cup of the beans. Bring to a boil over medium-high heat, then reduce to medium, cover, and simmer for 15 minutes. Remove and discard the rosemary sprigs and Parmesan rind. Stir in the remaining beans and kale. Return to a simmer and cook, uncovered, until the kale is tender, about 5 to 7 minutes. Taste and season with salt and pepper. Drizzle with olive oil, sprinkle generously with grated Parmesan, and serve with lemon wedges on the side. Excerpted from “Milk Street: Tuesday Nights.” Copyright © 2018 by Christopher Kimball. Used with permission of Little, Brown and Company, New York. All rights reserved. Send comments to magazine@globe.com. This story has been updated to correct the photo credit, which was wrong due to incorrect information provided to the Globe. The photograph was taken by Connie Miller of CB Creatives and the food styling was by Christine Tobin.